The next stage of the ancient alcohol flavorscapes story begins with the discovery and excavation of a grave. We don’t know the name of the individual buried in what professional archaeologists call a tumulus, an earthen mound about 20 m in diameter built in the 7th-5th centuries BC. The nearby Danube River is not much more than a large stream this close to its source in the area of southwest Germany known as Swabia. It runs past a hillfort settlement called the Heuneburg only about 3.5 km east of the tumulus cemetery this mound belongs to. Just up the logging road in the Speckhau forest parcel is a much larger tumulus, the Hohmichele, which was excavated two years before the outbreak of WWII. 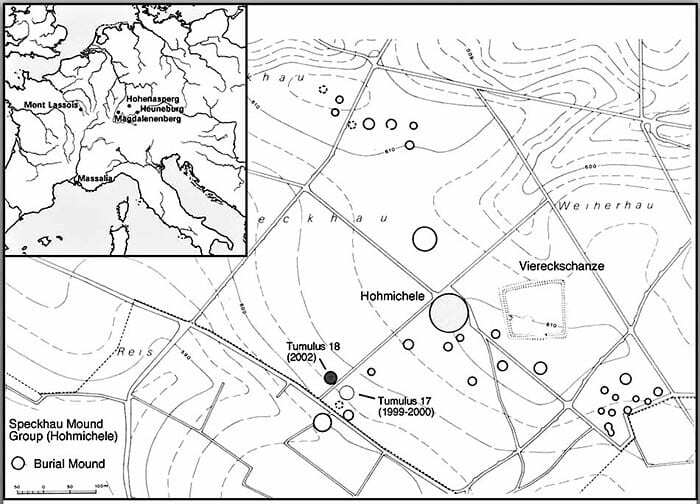 We were investigating the mound known as Tumulus 17 in 2000 because so little was known at the time about how the mounds clustered around the larger one were related to each other or to the hillfort, which saw an expansion of its population around 600 BC. We called the project “A Landscape of Ancestors” because the people who buried some of their dead in such a visible and impressive way were pretty obviously making a statement about themselves and their right to the land they occupied, a statement whose echoes were still audible even to us 2000+ years later. The burial with the cauldron was one of four we recovered in the mound; the skeleton had disappeared, literally dissolved by the acidic soil, but metal objects of iron and bronze as well as organic material in contact with them were still preserved. This is how we know that the dead man (probably male, because weapons are almost always found with biologically male individuals when skeletal remains are preserved) was placed in a chamber made of oak planks (still preserved under the cauldron), probably lying on his back and presumably clothed, although the only item of personal ornament recovered was an iron belt hook. This connected the two ends of a fabric belt made using a technique called tablet weaving that was decorated with a meander pattern (seen in the CT-scan image here). A 55 cm long iron slashing sword with a bird’s head-shaped handle in a cow-hide sheath wrapped in textiles was placed at his right side and two long iron spears with ash shafts were laid along his left shoulder. Also to his left was an iron object used to attach a feather crest to a leather helmet. Based on the presence of both spears and a sword and helmet we can date the burial to about 450 BC. At his feet was the bronze cauldron, wrapped in textile, a very rare find in Iron Age burials in this area of Europe. A similar example, but with the handles still intact (for some reason they had been torn off the cauldron we recovered) can be seen in the image shown here; it was found in Grave 6 of the Hohmichele mound not far from Tumulus 17. Based on other burials with such objects in them we expected to find that the cauldron had held an alcoholic beverage of some kind, so it was removed with the soil still inside it—the technical term for this is en bloc removal—and carefully subjected to a micro-excavation and restoration in the laboratory of the Baden-Württemberg State Monuments Office in Esslingen, Germany. The reinforced, riveted bottom and a riveted patch repair (see in the CT-scan image here) indicated that the vessel had been well-used; the burial of our unknown high status person was the last stage of that use-life. Some of the dark residue that can clearly be seen on the bottom (all that remains of the contents) was sent to Dr. Manfred Rösch, a paleobotanist at the Baden-Württemberg State Monuments Office in Hemmenhofen. The images show samples being removed by Head Conservator Tanja Kreß of the Baden-Württemberg State Monuments Office in Tübingen for microscopic analysis by Dr. Rösch, who is looking on. The results of his analysis are forthcoming in the final excavation report but we can already reveal that the contents consisted of a honey-based alcoholic beverage in which two plant species, represented by pollen remains, were present at levels suggesting that they were added as flavorings rather than simply plants visited by the bees whose honey had been used to make the beverage: meadow sweet (often found in prehistoric mead) and mint. The dead man in Tumulus 17 Grave 6 had been sent into the afterlife not only with his weapons but with about 14 liters of an alcoholic beverage that he could have used to establish himself as an important person in the next world as he had been in this one. The question now became: could we brew a beverage that would provide us with a sense of what the cauldron contents might have tasted like with these two flavorings?